I've joined the cupcake liner brigade and have posted my own version of liners on parade. Sometimes as I'm taking hundreds (only a slight exaggeration) of pictures of what must seem like the silliest things, I remember the days of film...having 24 or 36 chances at a perfect shot and developing the duds along with the keepers. Do you remember anxiously opening that sticky envelope full of photos, searching out the ones worthy of sharing and the ones destined for a box in a dark closet somewhere? It was so hard for me to throw out the bad ones...guilt would always ensue if I tossed out a loved one without a head or with red eyes. 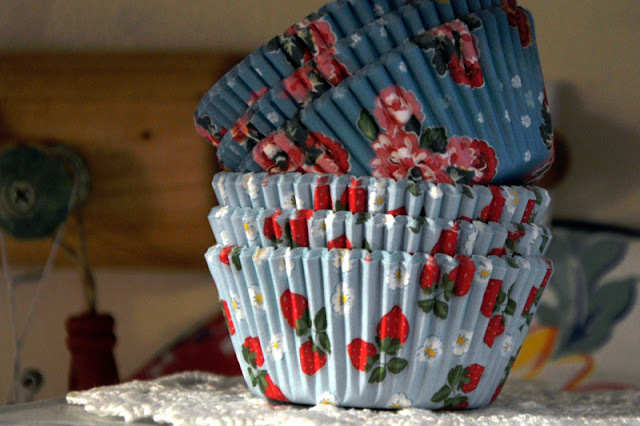 Thank goodness for technology and the ability to use up precious shots on something as fun as a pretty cupcake liner. Happy Monday all. Now go out and do something just for the sheer fun of it, before another Monday rolls around! NO blue Monday here, dear! This post made me smile...such cheerful palettes in your cupcake liners! I enjoy modern technology. With failing eyes, I often put mine on the tv before uploading! Makes one wonder what would we photograph if we only had 24 ~36 tries, doesn't it? Have a wonderful week! Love your kitchen vignette with the scale and bottles all made even sweeter by those adorable cupcake liners! I've never seen any like them! Your cupcake liners are so sweet! I remember the days of film only too well. I was really into scrapbooking back then & I took pictures like crazy. When that envelope came back, I couldn't wait to tear it open, never knowing what I would find. I don't miss that at all! I can remember running out of the store with the pictures in hand and sitting in the car to look at them. I remember well the photo envelopes arriving it the mail. I still have a hard time deleting bad ones however. How sweet those cupcake liners are. Here's the problem, I couldn't throw out the bad ones either. So guess who has boxes of old fuzzy photos? My work for 2012 is declutter so here is another area that needs desperate help. Have a great day!Hugs!! I love your blog and what you say about your home for your grandchildren! Ah,yes, Patty. I have some of those photos hidden away. This is the year to toss or organize them! The cupcake liners are so pretty on display that it would almost be a shame to use theme for their intended purpose! I hope your craft room project is progressing well and look forward to the grand reveal. Oh yes, I do remember the days of film and developing!!! Patty, love those cupcake liners. Happy pictures....all of them. Love the cupcake liner pics! And you're right, it is fantastic that we can "waste" pictures on what ever we want now! What pretty cupcake liners. I've never seen any like that. I am so glad for technology. I still have folders full of pictures stuck away in the closet. I really need to get those cleaned out this year. I love those liners and I want to get some of those cute ones. 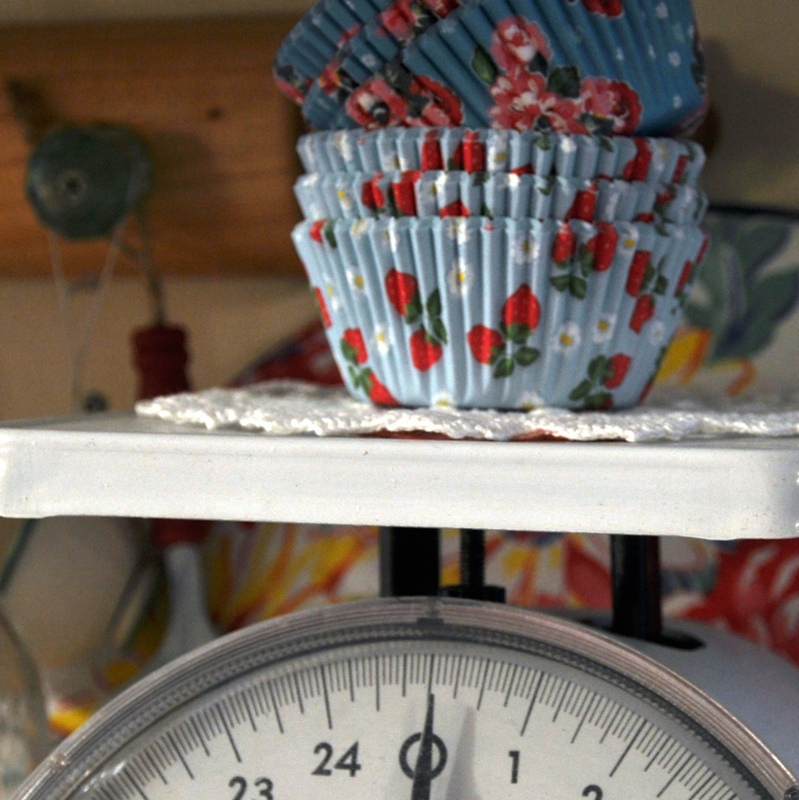 We make cupcakes a lot around here. Happy Monday!!! I e-mailed you about MLK day. I am so..glad we are past those days. I find I don't put many photos in my albums anymore though. I guess that's the downside. 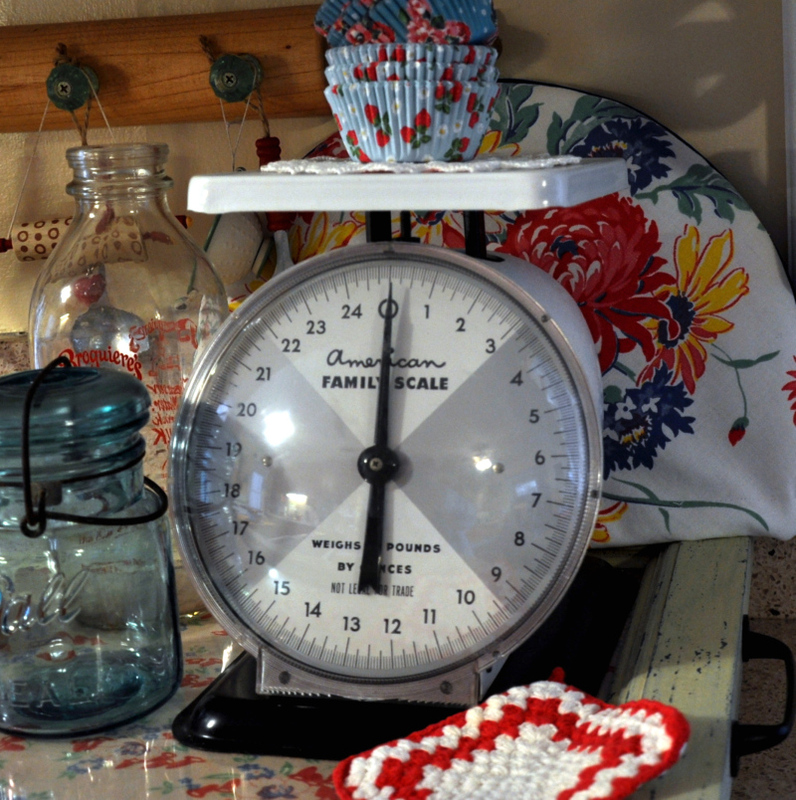 I'm loving you vignette with you new scale and milk jars! These pictures are simply delightful! I'm still one that has pictures in albums. Pictures are so precious to me. Happy Monday, my friend. Those are the cutest cupcake liners. And you are right about the pictures....I love digital photography. Poor Kodak, though. BTW....I wanted to invite you to stop by my blog. We are having an "impossibility" challenge for 2012! Just like you to create a post with unique, little cupcake papers and have it be so interesting that one needs to comment. Your kitchen vignette is so attractive, and the words on photography brought back memories that I had forgotten about in the age of digital photography. Love my happy visits here! Love your lovely vignette with the scale and cupcake liners. The liners are so Mary Engelbreit in design. Aren't they fun to collect! Michael's Crafts always has such a great collection of them. Digital photography...too wonderful! That's what my husband says all the time. Not about the cupcake liners...hahah, which, by the way, are adorable! I love Mondays. A fresh start, with a whole week ahead to get lots done. Such cute cupcake liners. I will have to look for some. The design on the ones I've found kind of disappears when I bake in them. I agree about the digital camera. It always takes me several tries for a good (or not so good) shot. I missed so many posts, just decided to start at the bottom.